Looking for a super fun, educational & inspirational outdoor challenge for your students at the beach? Then we would like to talk with you about teaching your kids to surf with our specialised programme developed in conjunction with Water Safety & Surfing New Zealand! Raglan Surfing School specialises in teaching school kids to stand up and surf. We’ve had the privilege of teaching this ancient Hawaiian sport to over 40 NZ schools & literally thousands of students- with our regular schools coming back every year to surf their socks off! We’ve got the experience & resources behind us to be able to provide an ocean activity that’s challenging & thrilling but also educational and most importantly safe. The 1:5 to 1:8 (depending on conditions) instructor to student ratios we adhere makes our school surfing programmes great value for money and ultimately means we can offer a better quality experience compared to other providers. Our crew of instructors are friendly, enthusiastic and keen to pass on their surfing knowledge to the kids. They will motivate your students – make them feel safe and comfortable in the water and will also cater to differing levels of ability amongst the group with the aim of getting them all up and riding. RSS instructors have the New Zealand Surfing Association NZSA surf coaching qualification as well as been trained life-guards so you can rest assured they’re in capable hands. Ocean conditions, tides, currents and wave knowledge. Ocean Preservation and Protection -environmental impact awareness. Practicing fundamental surfing techniques on land. Practicing fundamental surfing skills in the ocean. We tailor make school surfing packages to suit different budgets and group sizes and often organise other beach activities and adventure activities in addition to surfing for you. Popular options are beach volleyball & touch rugby, Raglan EELS, �kayaking, sunset harbour cruises and tramping. After an exhilarating surf session your students will be ravenous so picnic lunches or fish and chips can also be provided on the beach. The Raglan Surf School base in Whale Bay, the Karioi Lodge that is set on a 110-acre nature reserve and surrounded by lush green rainforest, provides an awesome share accommodation option for groups of up to 70. Check out the glow worm grottos at night, walk the bush track, enjoy the sauna & hang out up at the sunset lookout! Our luxury beach houses can also accommodate small groups & are in walking distance from each other in Whale Bay . All meals can be catered for if you don’t wish to make use of the full kitchen facilities at the Karioi Lodge. Our school BBQ’s & pizza dough workshops for ‘create your own’ pizza nights are legendary! As a part of the camp experience students are taught the proper preparation and cooking methods of fresh foods. Catering options & sample menus are available on request. Costs for the Camps vary and are based on group size, time of year and services required.Please contact us for an estimate & the various options open to you. We extend an invitation to tour the R.S.S & camp facilities in Whale Bay to all interested schools. We’d love to show you around and discuss your schools requirements in person. Alternatively please contact us for more information on school surfing, bookings and availability of dates. Please contact us for more details on. 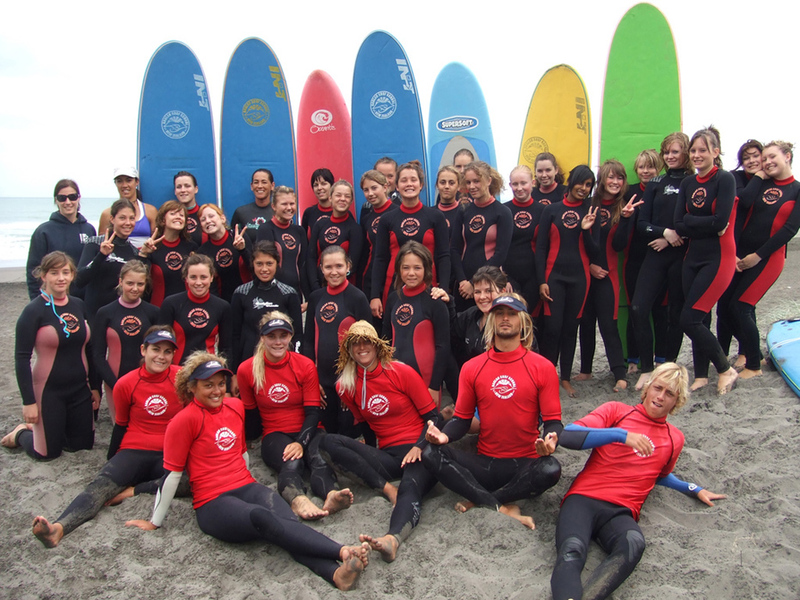 Visit our Raglan Surfing School website for more information.